Anadolu Efes published 1Q18 results that lived up to long-held expectations: strong pricing strategies that translated falling beer sales volumes into higher revenues; another good performance from Coca-Cola Icecek, which keeps coming to the Group’s rescue; and robust balance-sheet management, with leverage down on the year to 1.8x. While free cash flow (FCF) was negative in 1Q, this is largely a seasonal effect, leading management to reiterate their guidance for positive cash generation in 2018. There was also big news from the company’s International Beer segment, which is carrying out a joint venture (JV) in Russia with ABInBev. This new unit will be the second-largest player in the Russian beer market and should generate US$80-100m of synergies for Anadolu Efes in the next few years. However, as the Russian beer market is shrinking, we do not see this as a catalyst to drive the bonds tighter. Instead, we expect them to tread water against the sovereign in the absence of technical changes, such as a rating action. Anadolu Efes produced a reasonable set of 1Q18 results, despite the net loss of TRY106m (1Q17: TRY -85m). Sales volumes increased 7.9% to 18.9mhl, while net revenues rose 14.0% YoY to TRY 2.8bn due to price increases, higher volumes and the impact of foreign currency translation. 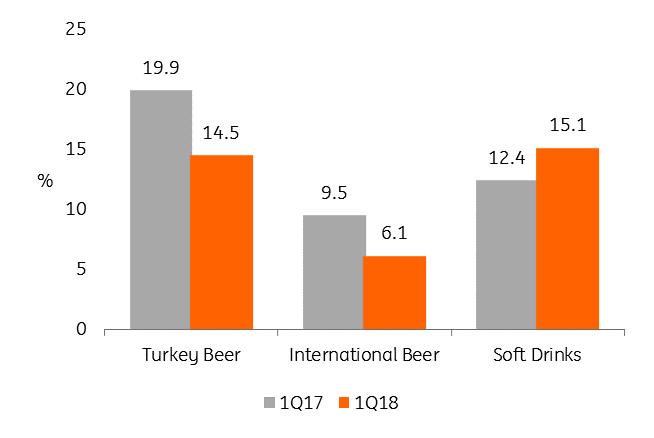 Looking across the company, net revenues for Turkish Beer improved 5.1% YoY to TRY310m on higher prices following the excise tax hike and cost inflation, while International Beer revenues rose just 2.2% YoY as distributors’ destocking caused a fall in Russian sales volumes. In fact, volumes declined 3.9% YoY in this segment, although Russian weakness was offset by a strong performance in Georgia and Kazakhstan. Overall, though, the performance of Beer sales remains weak. Volumes are falling everywhere, and only the company’s strong pricing strategy and positioning in the premium segment is keeping margins and revenue growth at acceptable levels. Anadolu Efes remains reliant on its Soft Drinks division (CCOLAT) for growth, where 1Q18 net revenues improved 19.9% YoY to TRY1.9bn. Bringing all this together, Anadolu Efes’ consolidated EBITDA improved 19.2% YoY to TRY352m as margins rose 27bp to 12.7%, mainly due to Soft Drinks and International Beer (excl. Russia). However, there was better news on the balance-sheet front, where higher EBITDA offset the effects of negative free cash flow (FCF) to allow net leverage to fall from 2.1x to 1.8x over the period. Anadolu Efes sales volumes rose 7.9% in 1Q18 to 18.9mhl. This was due to a 12.4% improvement in CCOLAT volumes, which offset a 6.1% decline in Beer Group volumes (-12.3% in Turkey, -3.9% in International Beer). Anadolu Efes managed to cushion the impact of the beer-related volume drops through strategic price increases, meaning that consolidated net revenues actually increased 14.0% YoY to TRY 14.0bn and EBITDA rose 19.2% to TRY352m, while the EBITDA margin improved 57bps to 12.7%. Once again, this was largely driven by the relatively strong performance of CCOLAT, showing the benefits of Anadolu Efes diversification strategy. Anadolu Efes beer operations account for 21% of consolidated Group volumes and 20% of EBITDA. 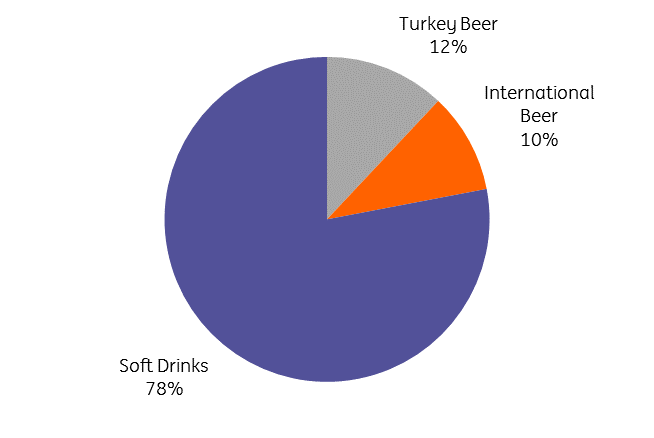 Within Beer, Turkey comprises 24% of volumes and 64% of EBITDA, with the International operations making up the rest. Within Turkey, volumes fell 12.3% and EBITDA dropped 23.4%, although revenues actually rose (+5.1%). The company was hit dealers’ stock-optimisation activities, in line with its commitment to deliver fresher beer to customers, though price increases offset these negative effects on the top line. It is interesting to note Beer’s sensitivity to price increases vs CCOLAT, whose products are so cheap that marginal price increases tend not to have a significant long-term effect on volumes. The International segment also had a tough year. Volumes fell 3.9% and EBITDA dropped 34.8% YoY to TRY35.4m due to the unhelpful product mix, fixed costs and lower volumes in Russia (though we note that Anadolu Efes managed to gain market share in the shrinking Russian beer arena). Once again, smart pricing and the currency effect led to a rise in revenues of 2.2% YoY to TRY583m. The main development in the International segment was the creation of the Russian JV with ABInBev, which will create a strong second player in Russia, the world’s sixth-largest beer market. The JV is split 50-50 between the two companies and controls Efes Russia, InBev Russia (to be merged) and 98% of InBev Ukraine. There will be equal board representation, with the Chairman to be appointed by Anadolu Efes. The new JV will have a 26.7% share of the market by value, behind Carlsberg’s 31.3% but well ahead of the next largest player (Heineken, with 13.4%). Anadolu Efes expects to capture US$80-100m of cost synergies within three years of the completion date (expected later this year). Coca Cola Icecek once again posted solid 1Q18 numbers. Sales by volume rose 6.7% YoY and net revenues increased 19.9% to TRY1.9bn, boosted by revenues in Turkey and a rebound in the International business, particularly in Central Asia. EBITDA rose 45.7% YoY to TRY282m, while the EBITDA margin improved from 12.4% to 15.1%, helped by the product mix and aggressive repricing following the introduction of a 10% special consumption tax on various soft drinks on 1 January 2018. The balance sheet also remained strong. While capex rose from TRY113m to TRY176m over the period, FCF was TRY8m in 1Q18, as higher cash from operations offset the increase in capex. 40% of capex is allocated to Turkish operations. Consequently, Coca Cola Icecek's leverage remained steady at 1.5x, down from 2.2x in 1Q17, as consolidated debt stayed flat at USD1.6bn. The average duration of Coca Cola Icecek's debt portfolio is a healthy 4.3 years (excluding the imminently maturing 2018 Eurobond), with 77% of debt denominated in USD and 20% in EUR. Anadolu Efes still expects mid-single-digits growth in sales volumes, tilted firmly towards CCOLAT, while revenues should outperform volumes across all business lines. EBITDA margins should rise across the group, FCF is expected to be positive for Beer and CCOLAT, and the capex/sales ratio should remain in the high single-digits area. Deleveraging remains a financial priority for the Group. However, we note that management is only “cautiously” maintaining guidance “for now” in the face of various economic, political and geopolitical challenges, implying that it could be revised down unless we see stronger performance in 2Q.